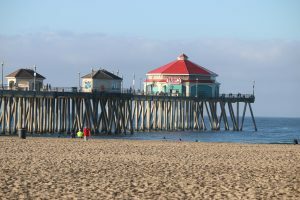 Once called Pacific City, Huntington Beach really is the beach city of California and the home of Summer Fun. Sure there is Newport, Malibu and even Santa Cruz, but nothing compares to Huntington Beach, especially when it comes to summer fun..
With the new shopping district that was given the cities original name, Pacific City, now open, there is more to do and see than ever before in Huntington Beach. Like any destination, parking is an issue. Beach parking, street parking and garage parking are all available, and all are paid. Free parking is quite a trek from anywhere you want to be. On par with Waikiki, or Bay Harbor in Miami, Pacific City offers a wide variety of great dining and shopping choices. Just like those other shopping districts, be prepared to walk. After all isn’t going to the beach about getting out and walking around to get some exercise and fresh air? Tuesday nights, you can still go simple and small with Surf City Nights, a sort of Farmers Market on steroids. Downtown Main Street is blocked off and there is fresh food, live entertainment and dozens of small local vendors selling unique and wondrous things. If you are looking for things to do at the beach or just an escape from the inland heat, this is where you can find it all. Great surf, sand, shopping, dining, fishing and people watching. With everything going on in Huntington Beach, you really don’t have any reason to stay on the couch do you? Next Topic: Is BMW Testing a B Class Killer?